All of the four main operating companies on the BIP have rigorous and robust systems in place to prevent and manage emergency events. Even though these companies are independent of each other, they work together through the BIP to maintain a safe work site. The BIP has seen over 70 years of safe operation across the Site and the BIP parties are committed to maintaining our safe record. In the unlikely event of a major emergency anywhere on the BIP, the combat agencies will work together with each other and the BIP to ensure the safety of the community. The NSW Police Force will provide essential information to the community, and until you are told otherwise you should stay in your home and await further instructions. General information on the incident will also be provided by Fire and Rescue NSW and through this website when appropriate. ➋ Close external doors & windows. 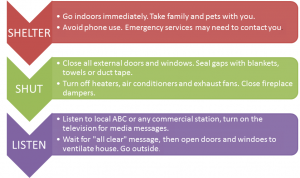 ➌ Switch off any air conditioners, heaters or exhaust fans. ➍ Remain indoors until you receive instructions from the emergency services. ➎ Also, tune into the radio or television and listen for information. The ‘all clear’ will be given by the emergency services. ➏ After the ‘all clear’ has been given open doors and windows to restore ventilation. Please cooperate fully with the instructions given by the emergency services. In the unlikely event that evacuation is required you will be notified by the NSW Police Force, who will provide information on alternative accommodation. The BIP and member companies maintain well-established emergency procedures and conduct regular training exercises. All member companies rely also upon the Ixom Emergency Response Service to provide specialist advice to the public, emergency services and customers in the event of incidents relating to the transport, storage, use and disposal of their raw materials and products. All plants conduct regular testing of alarm systems and leak detection systems to ensure they are available and in good working order. Neighbours may hear the several alarms being tested around the site on Thursdays. Joint exercises are regularly conducted with the BIP Safety Team and local emergency services personnel. The Emergency Response Service provides a 24 hr/7 day telephone advice and response service to the BIP and the local community.